We'll be happy to organize your trip within Costa Rica, whether you travel by air, car or bus. We can also make reservations for a hotel room in San Jose on your arrival or departure day. We have chosen a few hotels for their cleanliness, friendliness and prices according to your budget. Let us know and we'll do the leg work for you! If you drive, as you get within 10 kms of Nosara, look for our signs "Villa Mango B&B." Contact us for detailed directions. If you travel by bus or air, we'll have a taxi waiting for you in the village of Nosara. A taxi costs about US$15.00 to Villa Mango Bed & Breakfast. Nosara now has several car rental companies. Our preferred companies are Toyota, Economy, and National. Car rentals are also available upon arrival in San Jose or Liberia International airports. Four-wheel drive is recommended at any time of year. Nosara is approximately a five-hour drive from San José via the Bridge Tempisque and only two and a half hours from Liberia. Taxis are also available from San Jose ($250 one way) or Liberia ($130 one way). We can organize your taxi transfer or car rental for you as well! Sansa Airlines and Nature Air have daily flights from San Jose to Nosara, and sometimes a daily flight from Liberia. 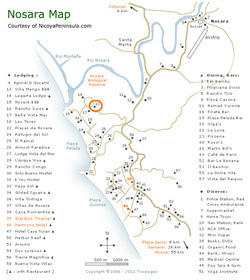 Since December 2008 Nosara has a brand new, paved landing strip! Cost varies from US$70 to US$140 per person, one way. Check the airlines websites or Contact us for more details. A direct bus departs daily from San José to Nosara at 5:30 a.m., leaving from the Alfaro bus terminal, 14th street, 5th avenue, in the center of San Jose. The fare is about $10.00 and it takes 5 and 1/2 hours to reach Nosara. Reservations recommended the day before departure. Bus travel from Liberia will involve several changes and it is not practical unless you have time. 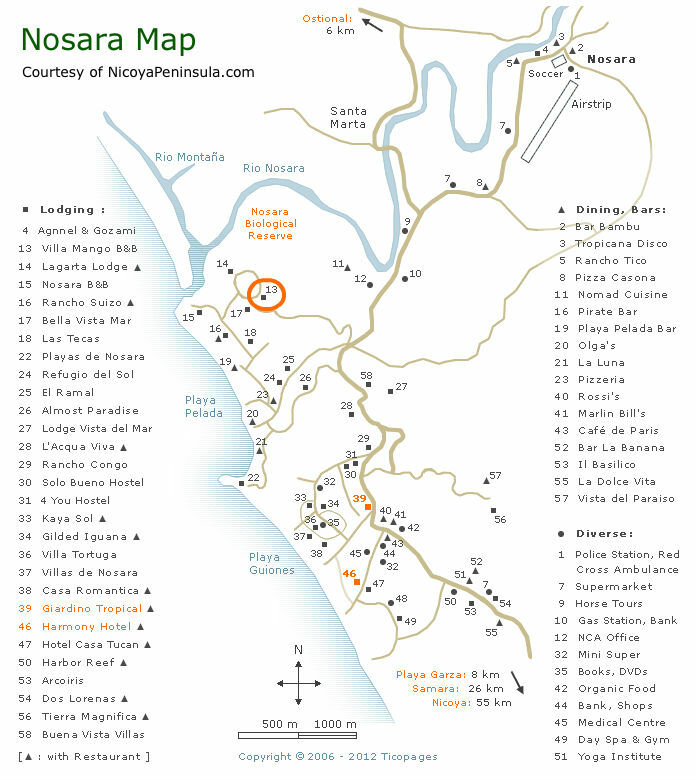 If you do travel by bus, make sure you reach Nicoya by 5pm as this is the time the last bus to Nosara leaves.